Variable frequency technology has allowed us to vastly improve your home water system by virtually eliminating pressure fluctuations. Franklin constant pressure systems use this technology to provide a never-ending supply of constant pressure for your home, allowing your water to do more for you. 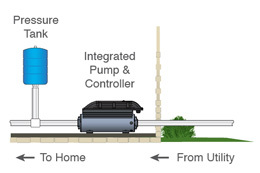 Franklin Electric's constant pressure systems, the SubDrive family, change the speed of the pump to meet the demand for water, while keeping pressure constant throughout the system. SubDrive systems use a pressure sensor to detect water pressure, send a signal to the controller and regulate the speed of the pump. 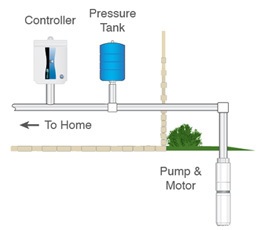 Instead of turning on and off when pressure tanks read a certain psi (generally 40 or 60), Franklin's constant pressure system keeps your tank at one pressure level, providing your home with a never ending steady flow of water. In a constant pressure system when water demand increases, pump speed increases and when water demand decreases, the pump speed will decrease. To maintain pressure in the most efficient way possible the pump only runs as much as necessary to meet demand. Also, Franklin constant pressure systems do not require large tanks for storage; smaller and lighter tanks can be used and even mounted off the floor, saving space. Compare a conventional well system to a constant pressure system. A constant pressure system added to your city/municipal incoming water source is not only able to boost the pressure of your water but also provide consistent water pressure when there are changes to the water demand throughout the house and yard.